Edinburgh Capitals, for whom player-coach Michal Dobron iced in his one 1000th match as a professional, were beaten 5–2 by Sheffield Steelers in Yorkshire tonight. After a scoreless opening period, three goals in seven minutes early in the second through Mathieu Roy, John Armstrong and Colton Fretter paved the way for the home side’s win before Jaroslav Hertl, with his first goal of the season, pulled one back on the power-play for Edinburgh in the 38th minute. 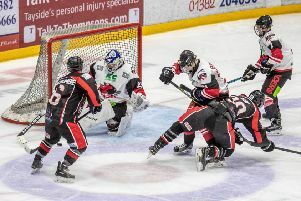 A goal with ten minutes to play from Mike D’Orazio midway through the third period brought Edinburgh to within one, however, Sheffield quickly restored their two-goal cushion, Mike Ratchuk scoring on a rebound at 51 minutes and 36 seconds. With two minutes remaining Dobron pulled goalie, Travis Fullerton, for an extra skater. Despite a mini barrage by the visitors on the Steelers net, Sheffield managed to break up ice, Armstrong scoring into the empty net to make it 5-2 with 40 seconds remaining. The result moves Sheffield to within eight points of Elite League leaders Cardiff Devils, whilst Edinburgh remain in last place on 19 points. Capitals return to action this weekend against Braehead Clan in Glasgow on Saturday, before Fife Flyers at Murrayfield on Sunday (face-off 6pm).